Brinner (“breakfast for dinner”) is one of my favorite meals. Breakfast foods are delicious and simple to make, and on a cold winter night they are a quick way to satisfy the whole family without a lot of fuss. When the weather is unpredictable, brinner is a great way to make a hearty, balanced meal out of standard fridge and pantry staples, handy if the roads are too snowy to run to the store. As much as I love a good stack of pancakes or a perfectly made omelet, I am always on the lookout for new ways to present old favorites. Waffles are perhaps one of the first breakfast foods you might think of, but until now I haven’t typically loved them for dinner. Sweet and fluffy, dripping with syrup or piled with fruit and whipped cream, they always seem a little insubstantial for the main meal. But with a little imagination, I’ve discovered that white-flour waffles are just the beginning of what a waffle can be. There is no law that says what’s cooked on a waffle iron has to be sweet. Made with the same ingredients as bread and biscuits, a savory waffle provides a blank canvas for just about any flavor combination you can come up with and can be used in much the same way. A sandwich made with waffles is warm and hearty; a waffle served with a bowl of soup or chili is a great “dipper” and can be made in a hurry to take the place of ho-hum crackers from a box. 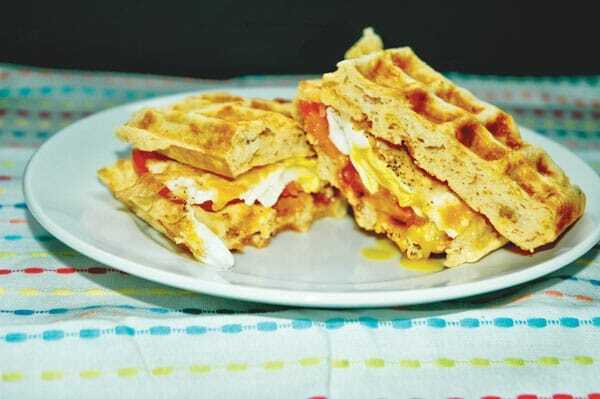 The bacon and cheese laced waffles I have made here make an amazing sandwich, piled up with tomato, cheese and an egg over-easy. The recipe is very basic, easily adapted to a number of different flavor combinations. Add pepper jack and chopped green chile, top with egg and salsa and voila, it’s huevos rancheros waffles. Sauté a little sweet onion, add shredded Swiss cheese and then pile with thinly shaved ham for something reminiscent of a Monte Cristo sandwich. 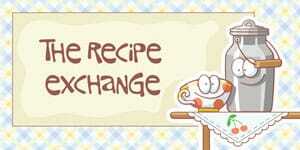 Make the recipe as written here and top with applesauce and sour cream for a treat that is rich and decadent. Once you have dipped your toe into the pool of waffle possibilities, it likely will not be long before you are firing up your waffle iron on a regular basis. The Internet is full of ideas on what can be cooked on this humble appliance – hash browns served up crispy and thin, holiday stuffing cooked as a base for leftover turkey or ham, and grilled cheese with a funky checkerboard pattern on the bread. Several years ago, a friend introduced me to brownie waffles. She mixed up a boxed brownie mix, using the ingredients listed on the package, then added an extra egg. She cooked the mixture on a well-greased waffle iron, and then topped the waffles with vanilla ice cream, a drizzle of hot fudge and a dollop of whipped cream. The warmth of the brownie melted the ice cream a bit, and turned the whole thing into something magically delicious. When it comes to cooking on your waffle iron, the only limit is your imagination. And, if you happen to have leftovers, you can always have them for breakfast. With a whisk, mix flours, baking powder and salt. In a separate bowl, mix milk, egg, and melted butter, then add the mixture to the dry ingredients. Mix ingredients well, then fold in cheese and bacon crumbles. Cook on a preheated waffle iron and serve immediately topped with thinly sliced tomatoes, cheese and an egg over-easy.